Prestige 5 + WNV (West Nile) with Halogen (10 dose vial) is the industry's first 7-way Vaccine plus West Nile with the Havlogen Adjuvant and our most popular equine vaccine. For single dose order Item #XXT2225 - $41.90 (Same vaccine as Prestige 5 + WNV-which is on manu. Back Order. 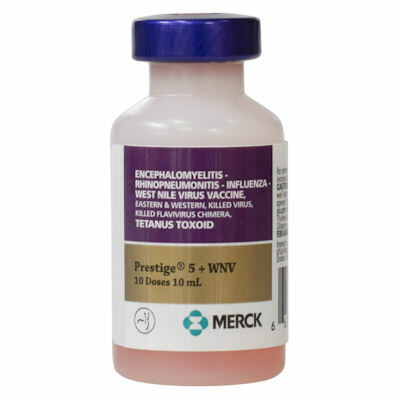 Merck has changed the name to Prestige 5 + WNV because they added new Flu strains:Florida/RW/13,EIV A/Equine2/Kentucky/02, American, EIV/eq/Richmond/1/07 to improve the Equine Flu coverage. Prestige 5 + WNV is a killed virus low-volume vaccine that protects healthy horses against Equine Encephalomyelitis Eastern and Western(sleeping sickness), equine Herpesviruses(Rhino) EHV-1 and EHV-4, and also produces immunity for Flu virus subtypes A1, A2,plus 3 important new Equine Flu strains just added to this vaccine hence the name changed to Prestige 5 + WNV , Tetanus and West Nile protection - All in one vaccine.